The Lightweight Castle Dress is a handmade medieval-inspired gown crafted for effortless elegance and comfort. This fully lined historic dress is made from 100% soft and breathable muslin cotton, commonly used for chemises. Elastic insets in the back help cinch the waist of this dress, which is further accented by a triangular patterned band. Its sleeves are fitted until the elbow, where they are embellished with matching triangular detail before widening dramatically to form an elegantly draping open cuff. The Lightweight Castle Dress features a wrap around style and is fastened at the front with four buttons, connecting the curving front hem of the dress to the torso. 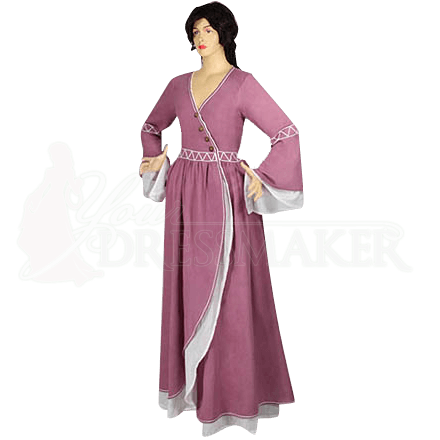 Wear this fashionable light pink medieval-inspired dress to your next historic reenactment event or Renaissance festival for a delicate and comfortable look.